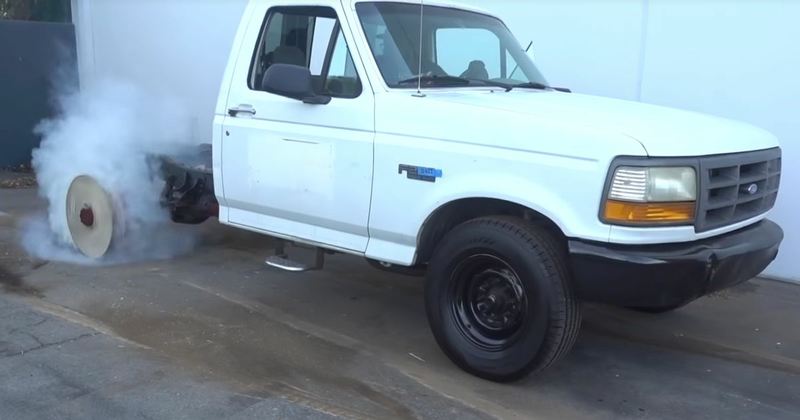 This old Ford F-250 sports rear wheels made from bits of plywood, and they hold up pretty well under stress! When the team from Scumbag Labs made a pair of wheels from sheets of plywood - held together by glue and a few screws - the assumption was they wouldn’t last long during a burnout session. With little space between the eight lug holes, the middle portions could just disintegrate. Or perhaps the layers of plywood might separate. And if that doesn’t happen, there’s always the chance of fire. In the end, though, they held up remarkably well, allowing this ninth-gen Ford F-250 to pull off some impressive smokey rear-axle antics. Perhaps disappointed by the lack of flames, the guys then doused the wheels with petrol and set them on fire for good measure. Well, no harm in being thorough.